The men’s 4x100m title could go to Brown, Princeton or Cornell. All three teams have run well under 41 seconds this season. Cornell comes into the championships with the fastest qualifying time, 40.43, which was run at the Larry Ellis Invitational. Ryan Hynes, Larry Gibson, Alex Beck, and Zach Menchaca will have to complete clean exchanges and run a season’s best to defend their title. Cornell has won this event 15 times since 1939 and they have been the only team to dominate the event for five consecutive years (2010-2015). Princeton should not be counted out of the race. Charles Volker, Josh Billington, Daniel McCord and Carrington Akosa will challenge the Big Red throughout the 400m race. Princeton has run 40.56 ahead of Brown’s 40.75. It has been 16 years since Princeton has claimed the championship title in this event though they ran a meet all-time best in 2014. The race for the next few places will include, Yale (41.88), Dartmouth (42.32), Penn (42.67), Harvard (42.83) and Columbia (43.02). Cornell could take home both 4×100 and 4×400 relay titles at these championships. They have run 3:11.55 this season with their ‘A’ team consisting of Michael Smith, Max Hairston, Larry Gibson and Tobe Attah. Smith, Gibson and Attah were part of the winning team in last year’s championship meet where the foursome recorded 3:10.90 for the win. If Cornell is able to win this race, this will mark the third consecutive year the team has won this event and the 21st time in history the program wins the title. Princeton should not be kept out of the medal count. Earlier this season at the Florida Relays, McCord, Jabari Johnson, Joshua Freeman, and Indoor Heps 400m champ Ray Mennin ran 3:11.92. The last time Princeton won this event was in 2013. Marc-Andre Alexandre, Connor Hill, Alexander McIntyre, and Alexander McDonald of Yale have moved ahead of Cornell and Princeton in the 1600m relay standings by clocking 3:11.40 at the UVA Challenge. A team from Yale has not run this fast since 2006 when they won the event in 3:10.84. The 4x400m race offers each leg an opportunity to challenge the leader and change their position. Brown will be among the teams trying to earn their spot. This season the Bears ran 3:12.48 at the UVA Challenge. Harvard has run 3:13.40, Dartmouth recorded 3:16.05, Columbia clocked 3:17.09 and Penn ran 3:17.13 this outdoor season. Three teams are in the race for the 4x800m Heptagonal Championship title. 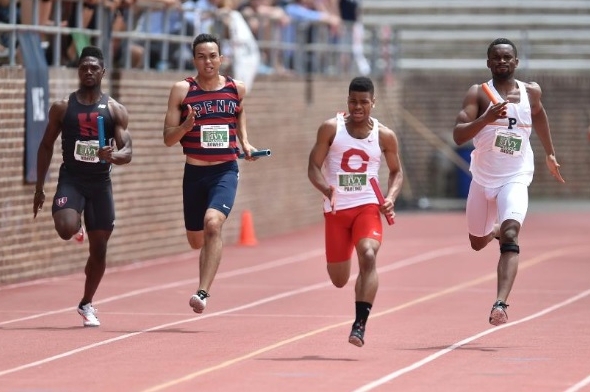 Columbia, Penn and Princeton have put together their fastest teams and recorded their fastest time during last week’s Penn Relays. Columbia’s Josiah Langstaff, Sam Ritz, Alek Sauer and Rob Napolitano ran 7:20.41 for the Lions, the fastest time in program history beating their all-meet top mark of 7:20.53 set in 2012. Columbia holds five of the championships titles in this event. Penn’s team of Elias Graca, Jeff Wiseman, Joseph Novak and Drew Magaha are seeded second in the event. 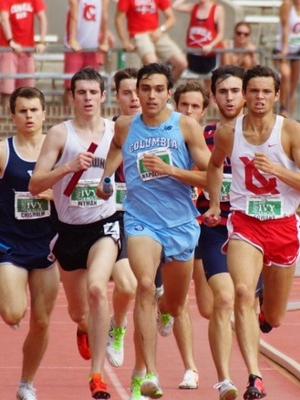 This team has run 7:24.47 to trail Columbia’s squad by nearly four seconds. Princeton is the final contender in this relay race. The team of Jared Lee, Joshua Ingalls, Franklin Aririguzoh and Zachary Albright have run 7:46.39 this season. While they may not be entering an outdoor seed time for this weekend’s championship, we should not count out the Indoor Heps champion Harvard. Their quartet of Jonas Aranda, Myles Marshall, Malik Epps, and Gabe Montague to win in 7:37.13 and hold off a hard charging Princeton team in the final laps of the race. Brown, Cornell, Dartmouth, Harvard, & Yale have not run this event during the outdoor season. This entry was posted on Wednesday, May 4th, 2016 at 7:00 pm. It is filed under Heps Champs, Men, Spotlight, Team Previews. You can follow any responses to this entry through the RSS 2.0 feed.